'All About Presentations' by Jazz Factory: How to animate line charts so they come one after the other? How to animate line charts so they come one after the other? You are presenting the sales trend of Product A, B and C. You have a line chart. Instead of showing all the 3 lines at once, you want to click and show the line graph of A, then talk about it. Then you want to go to B and then C. How do we do this animation? 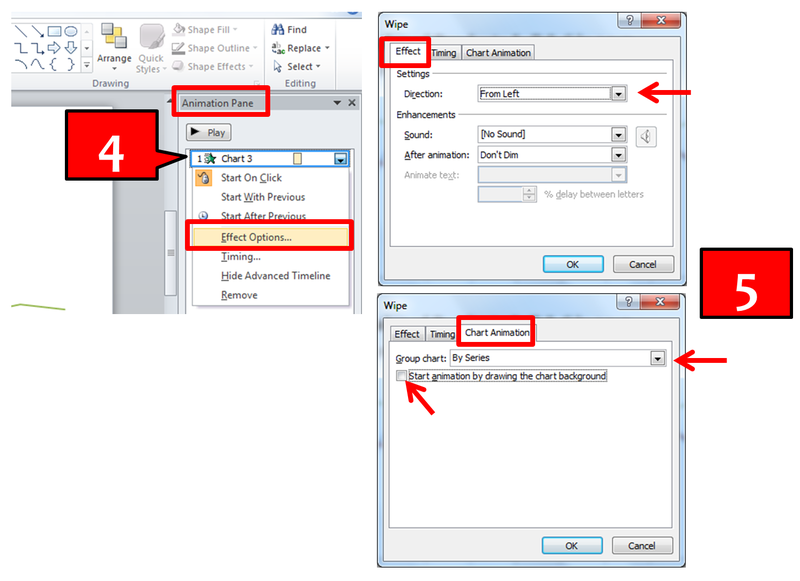 Here it is in a few simple steps (in PowerPoint 2010). The process is almost similar in 2007. In case you have any problems, leave a comment or send me an email. Step-2 Left click on the chart to select it. Under Animations Tab on top -> Go to Add Animation. Step-3 Go to More Entrance Effects -> Wipe. Wipe is a good effect. During final presentation, the lines will come from left to right smoothly. Step-4 Under Animation Pane on your right -> Click on Chart -> Choose Effect Options from drop down. In PowerPoint 2007 choose this from 'Custom Animation' panel on your left. 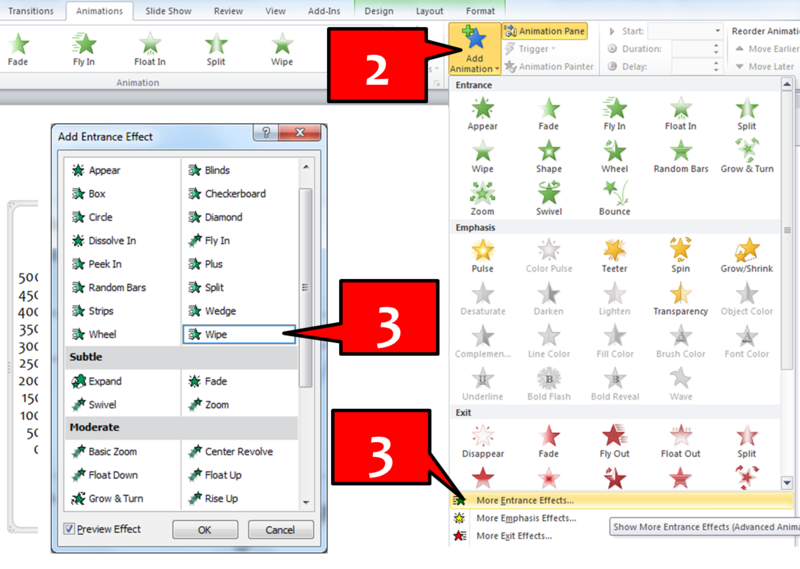 Step-5 Under Effect Options window there are three tabs (Effect, Timing & Chart Animation). Under Effect Tab -> Choose direction from left. This will make the lines come from left to right in final slide show. Under Chart Animation tab in the same window -> Choose Group Chart by series (This will make sure Product A, B and C will come one by one) -> Unselect the check box which reads 'Start animation by drawing the chart background'. If you keep it selected then the chart axis and grid lines also get animated. Step-6 Changing the speed of animation. Under Animation Pane on the right. Click on chart and choose Timing from the drop down menu. Select Medium or Fast as you wish. Great! Help me a lot. Just what i need it! Thanks. That was brilliant!!! Thank you for the help!!!!!! How does one animate the Series in a custom order? Like show Series 2, then 1, then 3? PowerPoint does not allow us to reorder the animation. There is a way to bypass this. However, in the new method we cannot make all lines come on click. Line 2 can come on click, after which the others will come 'after previous'. We use the 'delay animation' feature to achieve this. Will put up a separate post to share the same. Thanks for the link though. That's a great solution. That was really helpful - thanks!!! I was really getting irritated by not able configure line by line appearance in ppt 2010. Your explanation really helped me to do it. Ofcourse now it seems simple. Is there any way to make one series appear and disappear before showing the next series? Possible. A bit complicated though. By using the technique given here (http://www.pcreview.co.uk/forums/reorder-animation-data-graph-t3948561.html) you can split the charts as separate objects. Then animate each line. First, make it appear. Then make it disappear. Let me know if you figured it out. You saved me a lot of stress..thanks very much.. Thank you for the play-by-play. Very helpful! Thanks. is it possible to make the lines disappear after talking about each of them? like Line 1 should fizzle out as Line 2 is entering and same thing for line 2 as line 3 is entering. Is there a way this can be done in powerpoint.